All other inquires, email us for an appointment, and include your name, phone number, and school/business that the jacket is for. We will not respond if your phone number is not present. Fall 2009, Varsity Jackets for Christmas Delivery (Local pickup) must be placed by October 20th, while spots are available, that date may change at anytime. No exceptions, no rushes. Place your varsity jacket order between the months of May, June & July, to receive $20 off your total. All varsity jackets are made in house and can have regular embroidery and/or chenille stitching. Please bring in your varsity letter. Our signature Diamond Sparkle Material even more impressive than Rhinestones, in direct sunlight. No picture or video can do it justice. You have to see it with your own eyes to believe it. look for our original private label, kap varsity, to know you have an authentic premium quality jacket from get customized. XS, SM, MED AVERAGE PRICES FOR high SCHOOLS ARE $359-$419. LRG, XL AVERAGE PRICES ARE $399-$501. 2XL average prices are $451-$536. 3XL average prices are $481-$581. 4xl average prices are $516-$626. 5xl average prices are $565-$690. Jackets can go up to sizes, 10xl. the larger the jacket, the more wool & leather. The lower price range is with regular embroidered words, the higher price is with "old School" chainstitch words. These prices include, the highest quality, thick quilted lined wool body, thick leather sleeves, and superior shoulder stripes. 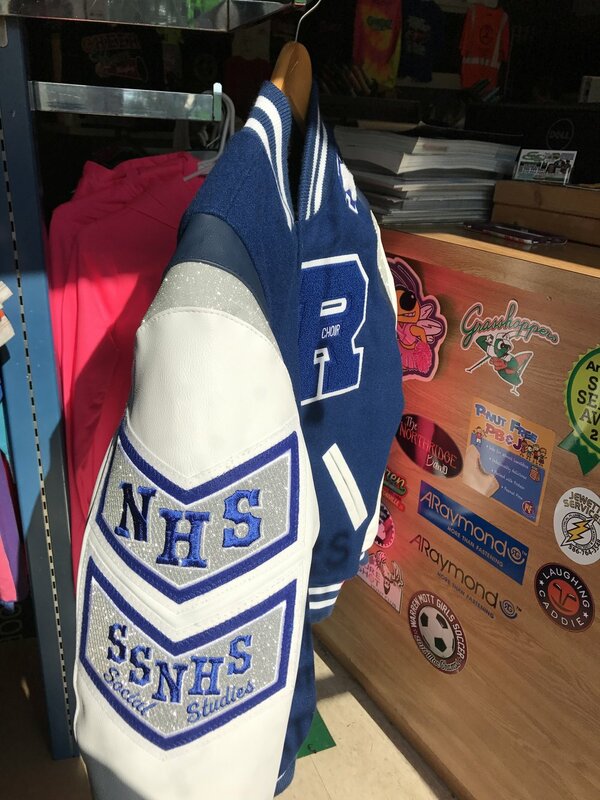 All Letterman Letters, and numbers are double stitched, included to avoid lifting, and all jackets are manufactured, and fully decorated in the USA. We have had Mom's tell us that their son or daughter just "had to get their jacket from Get Customized, and Get Customized only". With good reason. Your son and/or daughter knows after seeing all the other jackets at school, that our jacket back design is far superior to any other place out there, with the largest, most impressive, and highest quality jacket back designs possible for your coat. Everyone notices the difference when you get your coat from Get Customized. We have had Moms tell us that they are stopped by the opposing team when at an away game, 30 min from the home team, wanting to know where they got their coat. And in one instance of a custom football design for the back of her son's coat, we were told weeks later, that her son slept in his coat for 3 days straight, and never took it off. With feedback like this, we know we are the best in the business. Prices include your jacket back design of School Name at the Top, one school mascot character in the middle (or sport design), and 2 lines of text at the bottom. On the front it includes the sewing on of your letter (you bring in). The sewing of your graduation year (you bring in), and embroidery stitching your name on the front. If the school did not give your graduation year numbers patches, you can purchase it from us. These prices are for normal embroidery, old school Chain-stitching and Chenille is extra. Also any specialty items listed below is extra. Some Varsity Jacket pictures shown with extra space below the sport on the back. That extra space is room, for another sport when the teen receives the Letter in that sport. Then they bring back the coat to have that word added, after they receive their letter in that sport. Usually adding another sport at the bottom is $40 (embroidery) if we originally made your coat. Our Trademark Diamond Sparkle. We can incorporate in the special shoulder stripes, as well as the magnificent designs on the back and patches. no one else in the world is doing this. you can only get it here. special football and basketball inside the custom shoulder stripes, as well as the patches. real 3d feeling like your touching the real ball. our amazing new shimmer material adds a splash of brilliant color to your shoulder stripes, in tons of colors, made especially for dance studios, dancers, competitive cheer, and gymnasts. the sky is the limit, with the color schemes available for your custom club. but i'm vegan........ only here, you can opt for our imitation leather for your jacket sleeves! no one will think it looks different, no one will know. wool sleeves available also. we can make custom players. we can make elaborate custom players to look exactly like you. we can make custom mascots. we can redesign your old school mascot & make it look amazing, finally! and put the amazing design on your jacket! we automatically double stitch your front letter, without asking so your jacket looks top quality even a year later. we make custom patches, in chenielle, reflective material, diamond sparkle, shimmer, and 4 types of regular style patches. we can sew your patches anywhere on your coat with our special sewing machine. no more taking sleeves apart to get your patches on the sleeve, for an outrageous amount of money from the other guy. yes, we can sew on your pocket, and it will not sew your pocket shut. we offer a slim fit in the xs, sm, med, and lrg sizes. this is less bulk at the shoulders and tapers in at the waist about 2 inches for that slim look. please keep in mind that the design on the back will not look as huge as it does in the traditional fit. you can request an inside pocket for your cell phone. you can request 2 inside pockets for your items, one on each side. we offer "body length longer +2", sleeve length longer +2", or take off 1", etc.... off of your size. totally custom. we offer for girls who still want that contouring fit. we offer "the booty cut". the jacket will be slightly higher in the back to show off your slimming figure. our jackets have thick lining for winter months. you can request thin lining, so you can wear it all year round, or in warmer climates other than michigan. these jackets are top quality workmanship from the manufacturer, who are local, family owned, and take real pride in each and every jacket they produce. they have superior lining, wool body, leather, and thick durable knit at the collar and sleeves. we can offer a stunning jacket you can't get anywhere else, and ship it too you. we ship worldwide. sizing chart coming on the site soon in a couple weeks. we also have shipped elaborate biker vests worldwide. we have two names, we are also kickasspatches. Varsity Jackets for Christmas Delivery (Local pickup) must be placed by September 29th, while spots are available, that date may change at anytime. No exceptions, no rushes. Place your varsity jacket order between the months of May, June & July, to receive $20 off your total. ANY CLUB, ANY BUSINESS, ANY COLORS. THE SKY IS THE LIMIT. BACK DESIGN AND FRONT SB DESIGN HAS REFLECTIVE MATERIAL, AND LIGHTS UP WHEN CAMERA FLASH TURNS ON OR THE HEADLIGHTS OF A CAR AT NIGHTTIME. VARSITY JACKETS DETROIT METRO HIGH SCHOOLS NO APPOINTMENT NEEDED. BRING IN YOUR LETTER, ALONG WITH A THICKER HOODIE UNDERNEATH, TO MAKE SURE IT FITS WITH YOUR COAT FOR THE WINTER MONTHS. IF THE SCHOOL DID NOT GIVE YOU YOUR GRADUATING YEAR, YOU CAN PURCHASE IT HERE. 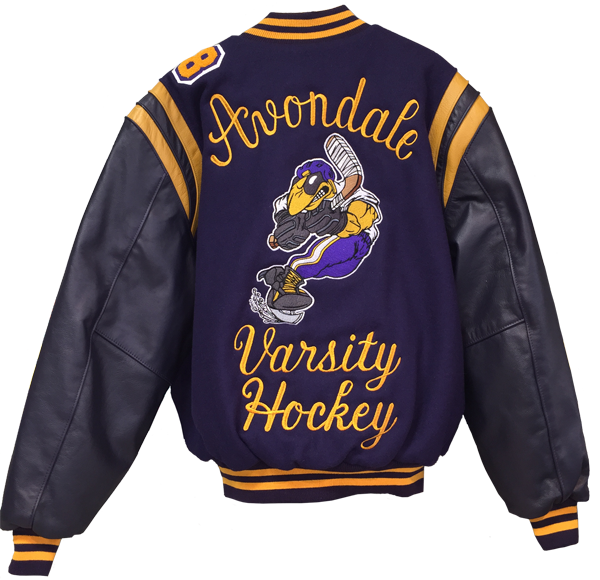 VARSITY JACKETS CUSTOM BUSINESSES, CUSTOM CLUBS, OR RECREATE YOUR OLD ONE FROM BACK IN THE DAY. YOU NEED YOUR LOGOS OF EACH DESIGN YOU WOULD WANT ON THE JACKET. ANY PICTURES, CLIP ART OR SKETCHES YOU CAN EMAIL AHEAD OF TIME. LOTS OF DETAIL, MEANS LOTS OF TIME ON THE EMBROIDERY MACHINE. TIME IS MONEY. EMBROIDERY IS PER STITCH COVERAGE, AND A SET UP FOR EACH DESIGN. SO THE MORE "CRAZY" YOUR PICTURES ARE, THE HIGHER IN PRICE IT WILL BE. PRICING IS NOT PER COLOR IN EMBROIDERY, ITS BY FINE LINES AND SMALL OBJECTS EVERYWHERE IN THE DESIGN. THE SMALLER THE OBJECTS, THE MORE TIME ON THE MACHINE. WE ARE VERY LIMITED FOR TIME. 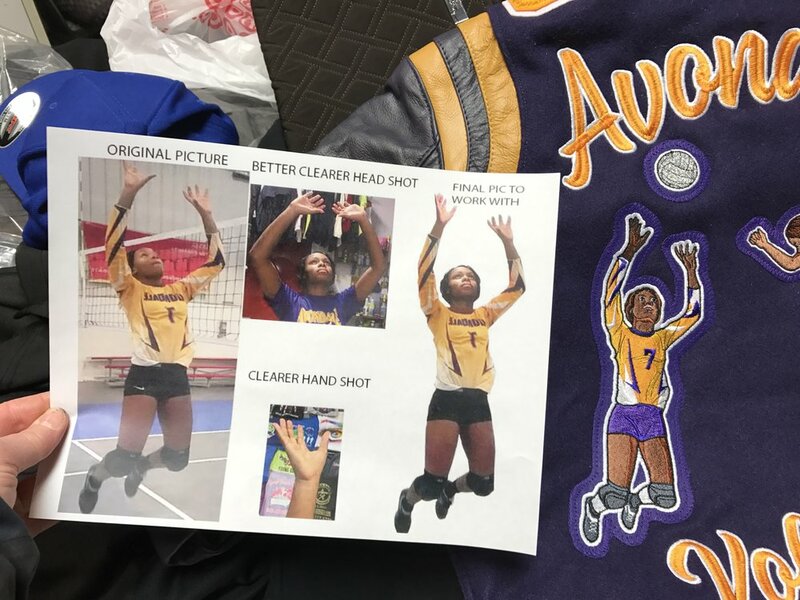 SERIOUS INQUIRES FOR CUSTOM CLUB/ JACKETS, EMAIL US YOUR INFORMATION FOR A PENCIL SKETCH LAYOUT OF YOUR JACKET, AND PRICE QUOTE FOR A NON-REFUNDABLE $45, THAT GOES TOWARD THE BILL OF YOUR JACKET. WHEN YOU PLACE YOUR ORDER OUT OF STATE WE NEED 80% DOWN, AND THE REMAINDER BEFORE WE SHIP IT. AFTER THE DEPOSIT, WE WILL EMAIL OR TEXT A COMPUTER GENERATED PICTURE TO SHOW YOU HOW THE BACK DESIGN WILL LOOK. A GOOD ESTIMATE FOR A CUSTOM LARGE SIZE MALE, 3XL WOULD BE $550-$750, JUST SO YOU CAN GET AN IDEA. YOU ARE WELCOME TO COME IN AND LOOK AT COLOR SAMPLES FOR AS LONG AS YOU WANT BEFORE THE APPOINTMENT, BUT WE CAN NOT ANSWER ANY OF YOUR QUESTIONS AT THAT TIME BECAUSE WE ARE BUSY MAKING THE JACKETS. FEEL FREE TO COME AND LOOK AROUND, AND TRY ON SIZES DURING NORMAL BUSINESS HOURS, BUT WE CAN NOT DISCUSS YOUR PROJECT TILL YOUR APPOINTMENT. YOUR EMAIL INQUIRE MUST CONTAIN, YOUR NAME, AND PHONE NUMBER, AND WE WILL BE CALLING YOU BACK TO DISCUSS YOUR PROJECT. EVERY JACKET IS CUSTOM AND WE NEED TO SPEAK WITH YOU ON THE PHONE. THE PERSON TAKING YOUR ORDER IS THE VERY SAME PERSON THAT MAKES YOUR JACKET. SO SHE NEEDS TO GET ALL THE DETAILS. IF YOUR EMAIL DOES NOT CONTAIN A PHONE NUMBER WE WILL NOT RESPOND. EMAIL: NAME, PHONE, ABOUT WHAT SIZE JACKET YOU WOULD NEED, SKETCHES/PICTURES/LOGOS, AND A COLOR SCHEME.